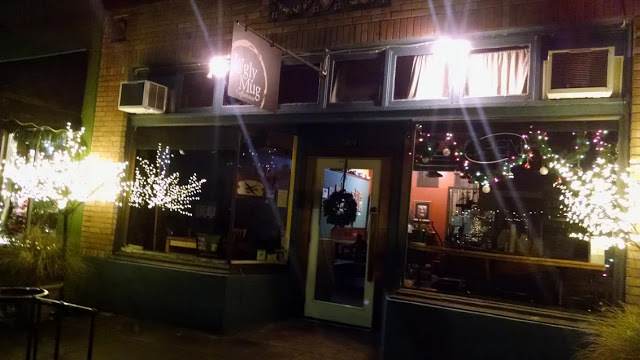 The Ugly Mug Coffeehouse is a Sellwood classic. In fact, it’s a Southeast Portland classic. Ugly Mug is one of those coffee houses where you just know you’re in Portland. It’s the atmosphere. It’s the great coffee. It’s the friendly service. But mostly, it’s the feeling you get while you’re there – like you’re in the heart of what you always imagined Portland would be and is. Ugly Mug was actually the first coffee house I visited when I moved to Portland over 9 years ago. I’d only been here a few weeks, and I met a friend there. I remember thinking “coffee houses like these are why I moved here.” It was a warm summer evening, and dogs were sitting outside with their people. Patrons were inside reading and chatting. And boy the place had character. Plus, Ugly Mug sits in a very cool, old historic neighborhood. Coffee houses like this were very hard to find in my old stomping grounds in California. Cole and Cheryl Akeman purchased Ugly Mug a few years ago, but the ethos is the same as when I visited the coffee house over the years. In fact, I never really noticed it changed hands until someone told me recently. Cole tells me they plan to keep it that way. Cole believes the “Old Portland vibe,” as he calls it, makes the place special and sets it apart from many other coffee houses in the area. I tend to agree. Ugly Mug is not pretentious or trendy in its decor. Yet, it serves some of the finest coffee in town and is truly a place where you want to spend some time. Cole Akeman is not new to coffee. Cole explains he’s always been a foodie and watched a lot of food t.v. while he was a stay-at-home-dad. But his history with coffee goes back even further. He was working in the coffee industry over 20 years ago for a boutique coffee company as a coffee roaster. He eventually got involved with the Northwest Roasters Group and got to know local and international coffee people. Cole even worked as a barista for a Starbucks while he lived in Southern California. Cole also took coffee roasting home. At one point, he had his own little table top coffee roaster at home and enjoyed making his own roasts and blends. Cole points out that it only takes about 8 minutes to roast coffee. “It’s a bit like popcorn,” he says. Apparently, you just need the right moisture content for the beans to swell and crack and roast. But, roasting equipment is very expensive, so it’s very difficult to roast at home on any kind of scale other than for personal use. Before owning and operating the Ugly Mug, Cole and Cheryl owned a food cart in one of the food cart lots downtown. They popped up all kinds of Kettle Corn. After owning and operating the cart a few years, Cole and Cheryl decided to sell it and move on to something else. A few years ago, they saw an ad that Ugly Mug was for sale, and they bought it. Cole and Cheryl didn’t change much at Ugly Mug. 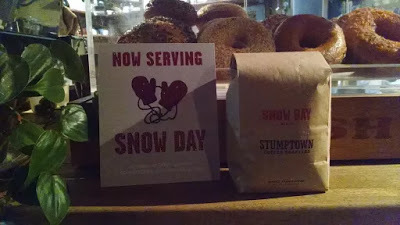 For example, it still serves Stumptown Coffee. Cole is a big supporter of Stumptown Coffee. He tells me that Stumptown makes sure its growers get a fair deal and is focused on improving the lives of the growers. Additionally, Stumptown roasts good coffee. Stumptown also trains all of Ugly Mug’s baristas, providing them with first-rate training in the art of making coffee. 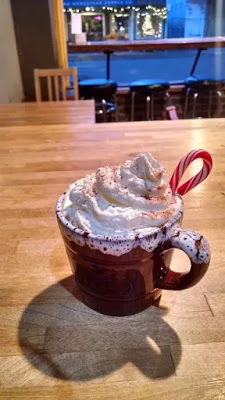 In fact, Cole wants Ugly Mug to make the best coffee in town. Stumptown also offers a unique cold brew, which is available at Ugly Mug. I had no idea that cold brew is less acidic and easier to digest, so it’s a great option for a lot of people who like coffee. Stumptown has a cold brew that’s a bit bubbly, like a stout beer. Stumptown pushes nitrogen through the cold brew concentrate, to create a frothy, cool coffee drink on tap. I tasted it. It’s yummy, and I can imagine loving it on a warm summer day. Of course, you can get this coffee on tap at Ugly Mug. 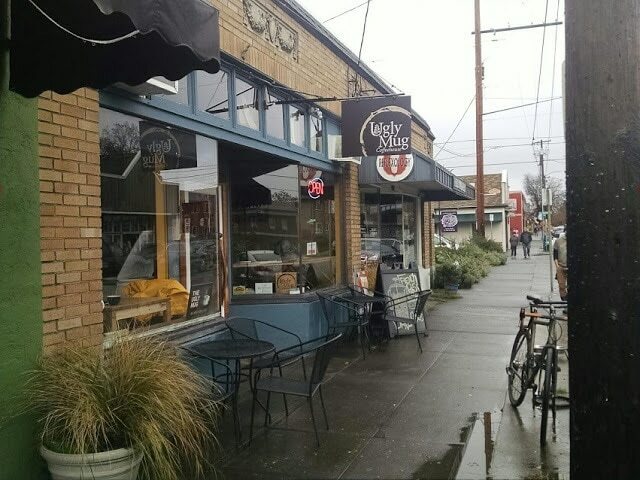 Next time you’re in Sellwood, you should really visit Ugly Mug, and look out for Cole! He’s usually there in the mornings and early afternoons. Ugly Mug is really a friendly place, where you can get a great cup of coffee, tea or pick up a snack or treat. I don’t know if it’s because Cole and Cheryl are long time Oregonians and Portlanders, or if it’s their touch and style. I suspect it’s a little of both. But, Ugly Mug really embodies the spirit of Portland. I can’t think of a better place to sip a cup of Joe, catch up on my reading, or just visit with the owners and patrons. Or visit its website – www.uglmugpdx.com.